In May and early June, across the western plains and basins of the North America (including Blue Mesa Plateau near Gunnison, Colorado) you’ll find the herds of Pronghorns expanding as their newest generation adds to their numbers. Although it is often called the American, or Prong-Horned Antelope, it does not belong to the true antelope family of Africa and Asia, but to a related family, the Antilocapridae, of which it is the only living member. Arriving at somewhere between 5 to 7 pounds while standing approximately 18 inches, one of the earth’s fastest land mammals is completely vulnerable at birth and must be hidden in the grass by its mother until it can use it’s gift of speed to out distance any enemy. 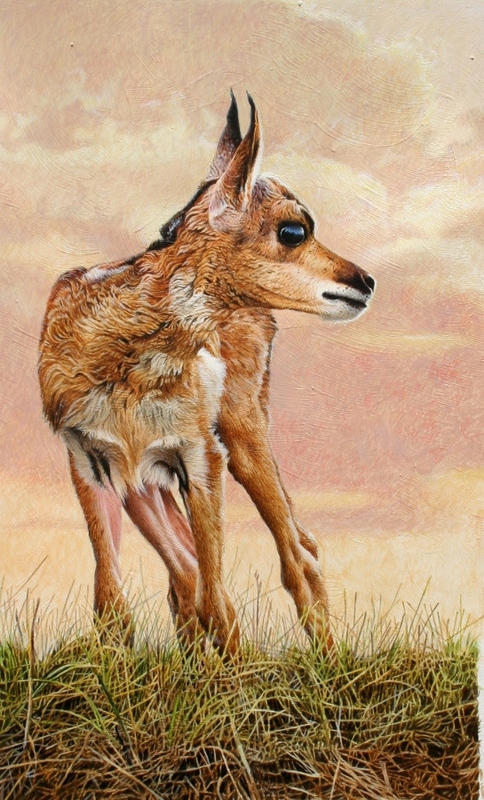 Within the first few days of birth, as it’s being strengthened by its mother’s rich milk, the young pronghorn can outrun a man and after a few more days it can outrun a horse, when fully mature the only land animal capable of matching the Pronghorns 60 mile per hour top speed is the African Cheetah and that is only in short bursts. Not only a sprinter like the Cheetah, Pronghorns can run at great distances maintaining a sustained speed of 35-45 miles per hour. Although built for speed, these animals aren’t known for their jumping, with the plains etched by sheep and cattle fences, Pronghorn are known as well for crawling under these obstacles rather than jumping over them.